I have had a few requests for what time different events will start so I am reposting the press release with the times in it. Hope to see you all tomorrow! STORYTELLING IS COMING TO AUBURN! The Auburn Winter Storytelling Festival on January 26, 2019 is a free community event bringing together storytellers from all over the state. The all-day event is at General Gomez Art Center, 808 Lincoln Way, Auburn, California 95603. A children’s hour with stories and music for families starts off the day at 10:30 am. Ed Lewis and Joan McCammon keep the little ones entertained with songs, stories and maybe even a parade. After a lunch break a free workshop titled “Story Play” taught by Joan Stockbridge will share tips and techniques to improve or even just began your own storytelling journey. Open Telling starts at 2:45. Anyone in the audience and tell a story. Rules are that the story must be no more than five minutes, must be family friendly, and told with no notes or props. Sign-up forms are available at the welcome desk. Who is the biggest liar in the neighborhood? The Liar’s Contest starts at 4:30 pm and gives tall tale tellers a chance to lay it on thick. Again, rules are a five-minute limit, family friendly and told with no notes or props. Tellers are asked to sign-up earlier in the day. At 6:30 pm six regional storytellers perform stories for a grown-up audience. Here is where you will hear about the lovely heifer taken to be serviced by a big ugly Brahma bull, or the holiday pie lost off the top of Dad’s car, or flapjacks that saved a family’s fortune in gold dust or…what will this year’s stories be? 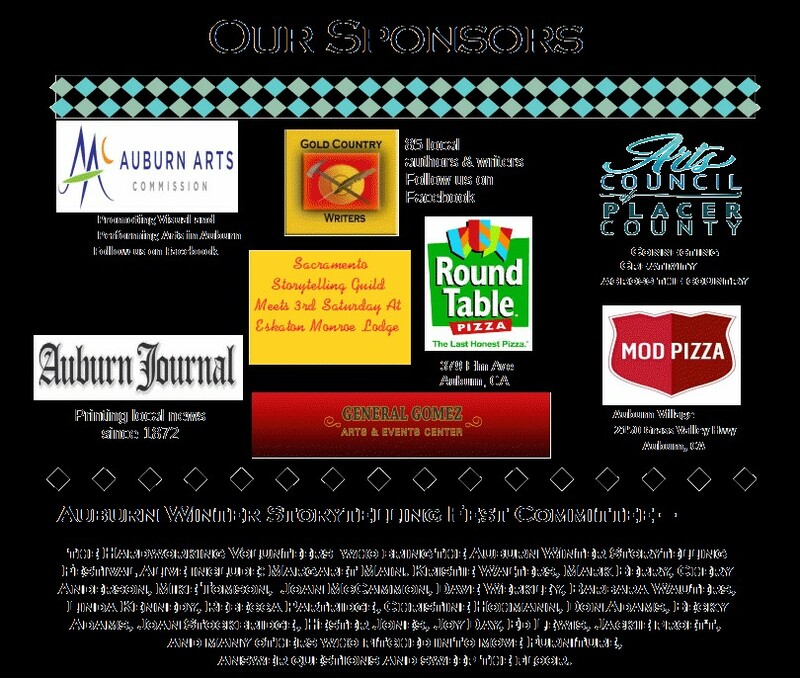 The entire day is FREE to the public made possible by sponsors that include the Auburn Arts Commission and the Arts Council of Placer County. This is the fourth Auburn Winter Storytelling Festival presented by the Foothill Storytelling Guild, an eclectic group of foothill people interested in keeping alive the art of telling stories aloud. AWSF is planned and executed by dozens of volunteers.